Visit Appellation, Hentley Farm and Fino Seppeltsfield on a gastronomic tour of the region. Enjoy a movable regional feast in the heart of the Barossa, celebrating a collection of talented chefs each committed to sourcing magnificent local ingredients and delivering a world-class dining experience. Start with seasonal tastes and textures at Appellation, paired with a refined gin from new neighbours, Seppeltsfield Road Distillers. 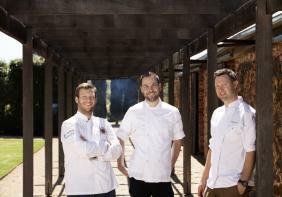 Next will be FINO at Seppeltsfield offering a regional shared menu at the iconic estate, followed by dessert at the award-winning and intriguing Hentley Farm. With each venue conveniently located within 10 minutes of each other and transport from The Louise included in your ticket, sit back, relax and enjoy the rolling regional feast.